The European polystyrene market has been estimated at USD 7,111.73 million in 2017. The market is expected to register a CAGR of 3.91% during the forecast period (2018-2023). 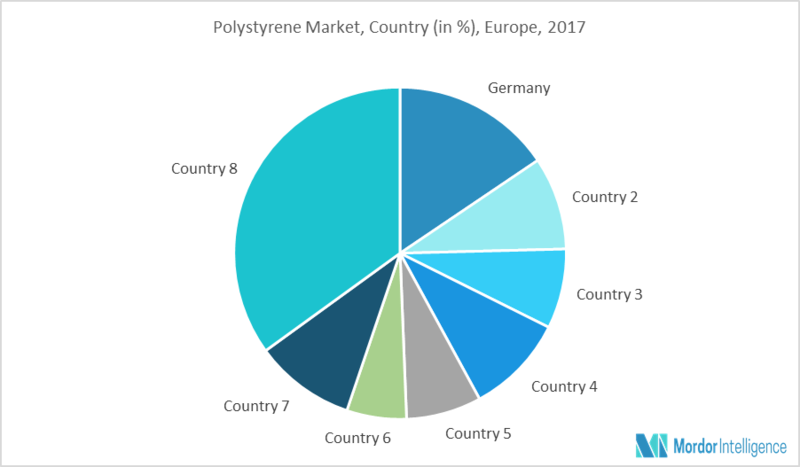 High-impact polystyrene (HIPS) dominated the European polystyrene market, with nearly 44% share, and is estimated to register the fastest CAGR during the forecast period. Europe has one of the largest polystyrene-recycling capacities in the world (27% of the total polystyrene waste generated in Europe). In 1992, the EPS (expanded polystyrene) organization from Europe (EUMEPS), along with the Asian and North American organizations, formed the international EPS alliance, with the goal to enhance polystyrene recycling around the world. This has led to increasing awareness about polystyrene recycling. The major countries where polystyrene is recycled are the Netherlands, Germany, Belgium, Italy, and France. As much as 60% of the polystyrene was recycled in the Netherlands in 2013. In Belgium, as much as 6.86 kilo metric ton of polystyrene waste was generated from the packaging industry, out of which 3.3 kilo metric ton was recycled in 2013. Recycling polystyrene reduces the amount of polystyrene litter, which is harmful to wildlife. It also leads to less landfill space requirement and saves the cost of disposal. High-impact polystyrene contains rubber. It is less transparent than GPPS and not clear. It is mainly used for products that require high-impact resistance. Packaging is the largest segment for HIPS. It is used for food packaging (meat trays, egg cartons, fruit trays, and dairy packaging), industrial packaging, and consumer packaging (cassettes, CD covers, etc.). HIPS is also used majorly in electronics & appliance applications, such as in computer housings, TV housings, and freezer and refrigerator liner appliance housings. Germany has the highest share in the European market, accounting for nearly 23% of the market in 2017. The market for Germany is driven majorly by the recovering construction industry. Non-residential and commercial buildings in the country are also expected to see significant growth prospects in the coming years. This growth is also supported by lower interest rates, increase in real disposable incomes, and numerous investments by the European Union and the German government. This is expected to lead to an increase in the demand for polystyrene in the country. December 2017: Trinseo announced price increases for polystyrene, polycarbonate, and copolymers in Europe. The major players in the market are Ineos Styrloution Group GmbH, Total, Trinseo, Sabic, and BASF. Other players Include Kumho Petrochemical Co. Ltd, LG Chem. Ltd, Synthos SA, DowDuPont , and Versalis SpA. Three-month analyst support, along with the Market Estimation sheet (in Excel). This report can be customized to meet your requirements. Please connect with our representative, who will ensure that you get a report that suits your needs.